That’s how I felt about our house when I first viewed it, I instantly wondered about who lived there before and what tales it had to tell. Every time we do up a room or take down a wall we find something about it’s past, it may sound strange but I believe it wants us to know where it came from. The one thing that really drew me to the house was its lovely red door, however, there was one little piece of the door that was missing. The missing piece sat on our windowsill for months and I thought nothing of it until I went to put it back in its rightful place. Initially, it had broke in two which I thought had happened with age and I put it back on the window. Taking a step back I noticed something on the piece of timber. Looking a little closer I soon realised that it was actually a secret compartment and concealed inside was a name. Joseph Hull, June 28th, 1878. There it was, written in pencil in the most beautiful handwriting, a name and date and believe it or not I found it nearly to the day somewhat 140 years later. Unleashing my inner Nancy Drew, I needed to find out who this man was and what was his story. The internet is an amazing invention; an endless supply of information that you can access at the touch of a button. And that’s where my research began. 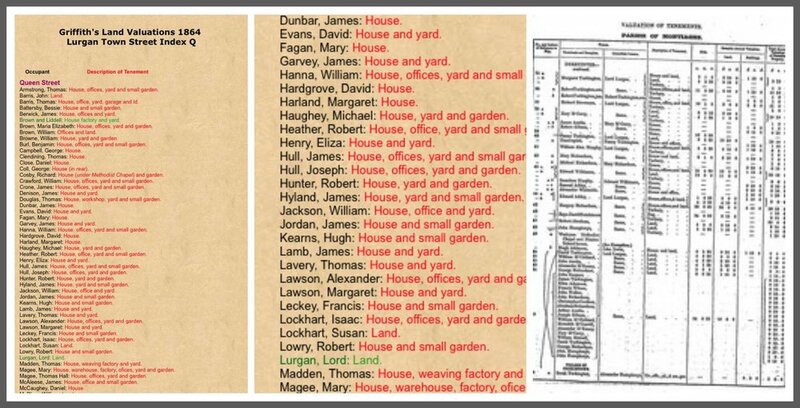 Very quickly I stumbled upon a really interesting site called Lurgan Ancestry and it was here that I located The Griffith’s Land Valuations 1864 Lurgan Town Street index, which would have been drafted 14 years previous to the date on my door. Excitedly, I scanned down the names to see if I could find my mysterious man and halfway down the page, there he was Mr Joseph Hull. It also revealed that he lived in Queens Street and that he owned a house, office, yard and small garden. Could it be my Joseph Hull? It fits the time frame and Queens Street is not too far from the location of my house and the fact that he had an office and yard suggests he had a business. So, I am going to put money on it that they are the same person. I can’t help wonder when he slotted in the final piece of woodwork onto our door, with his signature and date enclosed did he wonder himself who would discover it and how long would it be before it was found. I hope he is happy that that person was me, 138 years later. I have now put it back on the door and hopefully, it will be there for many more years to come. I said in the title that this was a door of two tales past and present. So now to the present! Personally, this door has a very special meaning to me as it's the very place where my best friend asked me to be his wife. Being a total romantic I always wanted to get engaged at Christmas however as we had just bought our house and were living with my parents I didn’t think it was going to happen for another year or so. It was our first Christmas day we had ever spent together and after opening our presents and going to Christmas Day Mass, Seamus (my husband) wanted us to go round to our house and check on it. When we arrived Seamus went to the front door and called me up onto the top step to look at something. It all happened so fast, as the next thing I knew Seamus had swung round and was down on one knee with a little ring in his hand. After total disbelief and tears rolling down my face, I jumped into his arms resulting in me nearly killing both of us by falling down the steps and that was it, we were engaged. Every day I walk under the arch of the door and I remember that day and hopefully, in years to come, I will be able to tell our children this very story. I hope that Mr Hull approved of Seamus’s gesture and I would like to think that he was looking down on us that day while saying to himself "Well done Mr Higgins, good job and thanks for keeping my door red. " "Once In A While Right In The Middle Of An Ordinary Life Love Gives Us A Fairytale"
Far Left: This picture was taken minutes before Seamus Proposed. 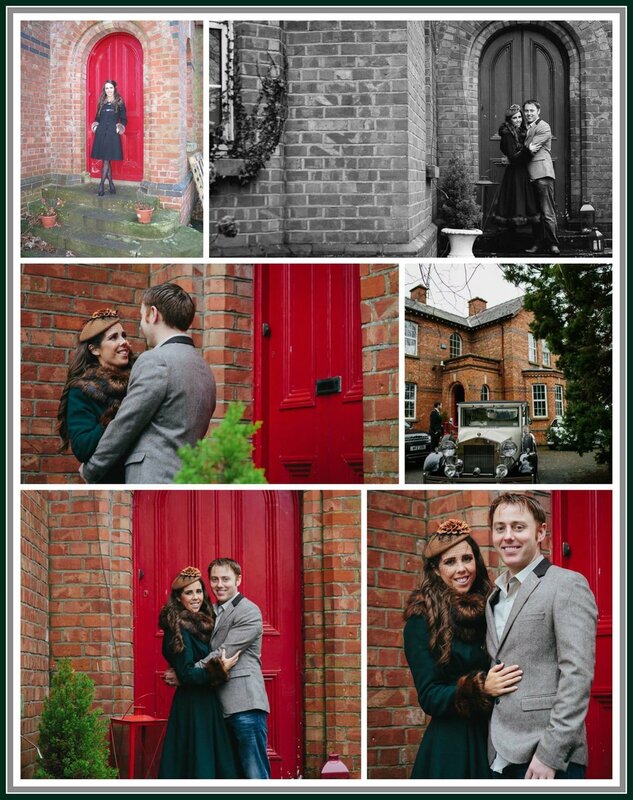 NB: This was taken before our door revamp — with Seamus Higgins and Aislinn Higgins.